Wednesday 5th October sees the start of my major 2011 exhibition, From Mountains to the Sea, at Lincoln Joyce Fine Art in Great Bookham, Surrey. The subjects range from coastal scenes, rural landscapes to the high mountains, with a number of overseas locations included. Naturally the mood of a place is a strong feature in each watercolour, as has always been one of my prime aims in depicting the landscape. 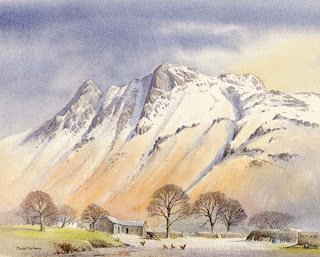 One of the paintings is this view of a farm in Upper Langdale in the Lake District, the tops dusted with a thin layer of snow which strongly contrasts the red of the dead bracken on the mountainside. This was painted from a sketch I carried out many years ago, for I have so many sketches and photographs that I can quite happily put many good ones aside for some time until I feel the moment is right. The only thing that was not actually present when I did the sketch is the group of chickens – these were taken from another source, and it pays to have secondary visual resources like this to beef up a composition, however good the original may be. 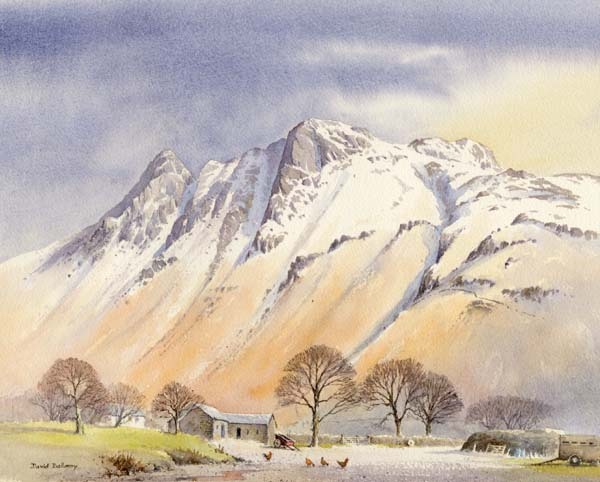 This entry was posted in David Bellamy, Exhibition of paintings by David Bellamy. Bookmark the permalink. Your work is always excellent. My best wishes for your exhibition.